YTI offers quartz crystal Sensor Heads for all your deposition monitoring requirements. The sensor heads are compatible with all crystals and controller / monitors. The sensor heads are machined stainless steel with a 1/8 ” water channel for cooling lines. The quick change crystal holder eliminates the need for special tools or handling of crystals. 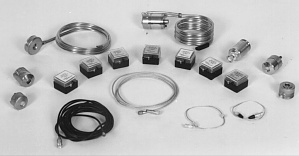 A complete line of accessories is available for both sensor heads. YTI also offers a complete line of new replacement quartz crystals. Custom crystals can be provided for most thin film monitor applications. We stock Sloan, Sycon, Kronos and Inficon compatible patterned crystals in 4 MHZ, 5 MHz and 6 MHz designs. Please call for a full description of components available and current pricing.